Chess is on its way to the esport world, around which a healthy industry has already popped up. Although not yet in the gamers big shows, we can trust chess could end up there in the near future. This is something the www.chess.com platform has understood and anticipated. 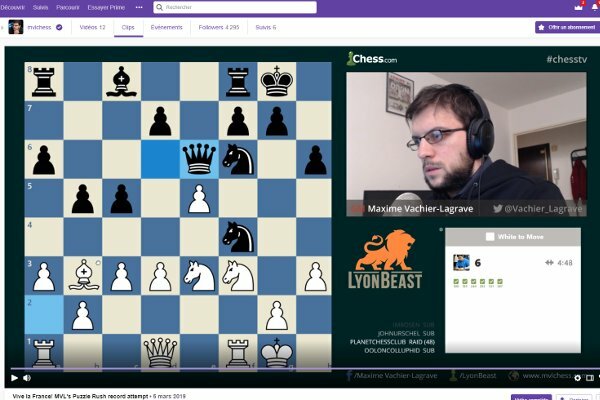 Armed with its more than 27 million members, the leader of the chess market has, amongst other things, sealed a partnership with the streaming giant www.twitch.tv, which offers various contents, though mainly based on online games and esport. Supported by chess.com, I launched my own streaming channel a few weeks ago, www.twitch.tv/mvlchess . Depending on my schedule, I can free up some hours to play and comment games live. For instance when playing online tournaments, like the Pro Chess League or the latest Usa-France consultation match, when MF Kevin Bordi and myself fought against IM Danny Rensch and Nakamura. I may also play casual games against strong players happening to be online, or dedeciate specific streaming sessions to playing against my subscribers only. Finally, I sometimes take up challenges, like when I tried to break Nakamura’s « Puzzle Rush » World record on March 5. 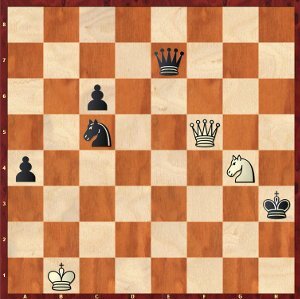 This game is all the rage amongst chess players of any level; you have to solve as many tactical exercises as you can – with growing difficulty – within exactly 5 minutes (with a tolerance of two mistakes, the third one being eliminatory). Let’s take a moment to look at the end of my finest series of that day. « Puzzle Rush », Try for 54, white to move. After 1.Qf4+ Kb6 2.Qxb4+ Ka6, I unfortunately played 3.Rf5 which leads to a quick mate, but this Puzzle Rush game is ruthless… 3.Rb8! was giving mate one move earlier, so my 3.Rf5 was counted as my second mistake! Good bye record! But for the sake of honour, I wanted to reach 54. 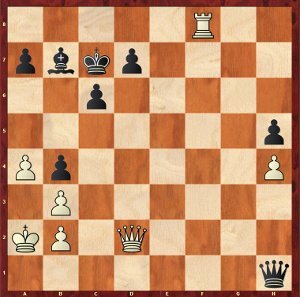 After 1.Ne3+ Kg3 2.Qg4+ Kf2, being under severe time pressure, I instantly played 3.Nd1+?, but realized just afterwards that the winning move was 3.Qf4+!, as white mates or wins the Queen after 3…Ke2 4.Qf1+ Kd2 (4…Kxe3 5.Qe1+) 5.Qd1+ Kc3 6.Qc2+ Kb4 (6…Kd4 7.Nf5+) 7.Qb2+ Nb3 (7…Ka5 8.Nc4+ Ka6 9.Qb6 #) 8.Qa3+!! Kxa3 9.Nc2 #. As for the record, that will happen another time! 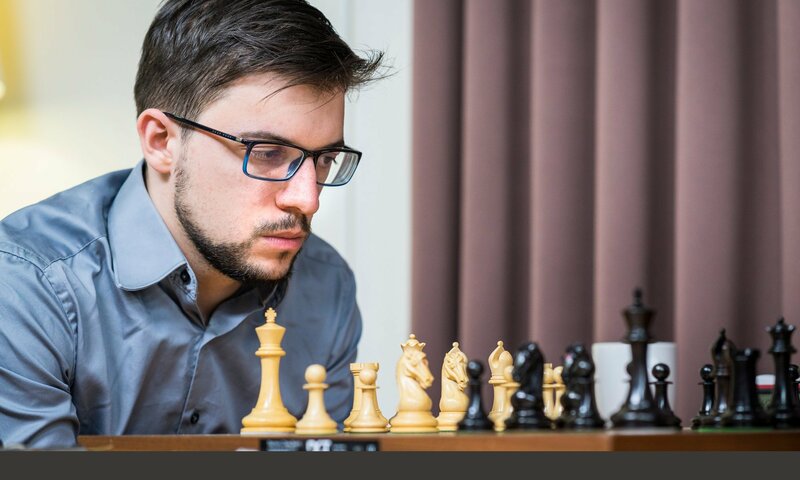 The 2019 Pro Chess League regular season is over for Maxime’s Marseille Migraines. The team ended up at the first non-qualifying place of its group, just behind the other French team, the Cannes Blitzstreams. Unfortunately, the latter didn’t manage to get out of the playoffs, and will miss the four-team finals. Though played online as the previous stages, these finals will also take place on stage, in front of the audience, in San Francisco’s Folsom Street Foundry early May! https://folsomstreetfoundry.com. Maxime will take small consolation from the fact that he was the best performer of the regular season, with 31/44 and a 2753 Elo performance – just ahead of Caruana 2752, and Nakamura 2751! Next PostNext A hell of a weekend!